PROTOTYPE. 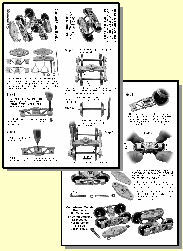 Modern design of cast secondary suspension bogie manufactured by Davis and Lloyd. Used extensively by British Railways from 1960 onwards on new build vacuum brake fitted wagons. Also used on conversions of unfitted wagons such as Bogie Bolsters, Boplates, etc into brake fitted to enable faster running. Designed for 3’1” standard wagon wheels (eg Slater’s 3 hole disc, 7122). KIT. Cast whitemetal parts are provided to build two complete bogies. Mounting and swivel fittings included. Sideframes are secured with pins allowing a small amount of compensation to give excellent track holding. Slater’s Plastikard, Old Road, Darley Dale, Matlock, Derbyshire, DE4 2ER, Telephone 01629 734053, Fax 01629 732235. Downloading the instruction booklet will allow you to evaluate the kit and its construction and help you to determine its suitability for yourself and your project.